Recruiting software that helps you manage daily tasks on one screen. There’s no time to waste when it comes to finding candidates for job order submittals, both from your existing candidate database and sourcing outside of your staffing software system. Low unemployment rates and a competitive hiring market creates difficult sourcing challenges for recruiters. While quality talent can be hard to find, your applicant tracking system can make it easier while increasing productivity. Find and place quality candidates with features that simplify workflows. Quickly narrow down criteria to meet client’s needs and use real-time activity dashboards to view prioritized job orders and placement progress at a glance. 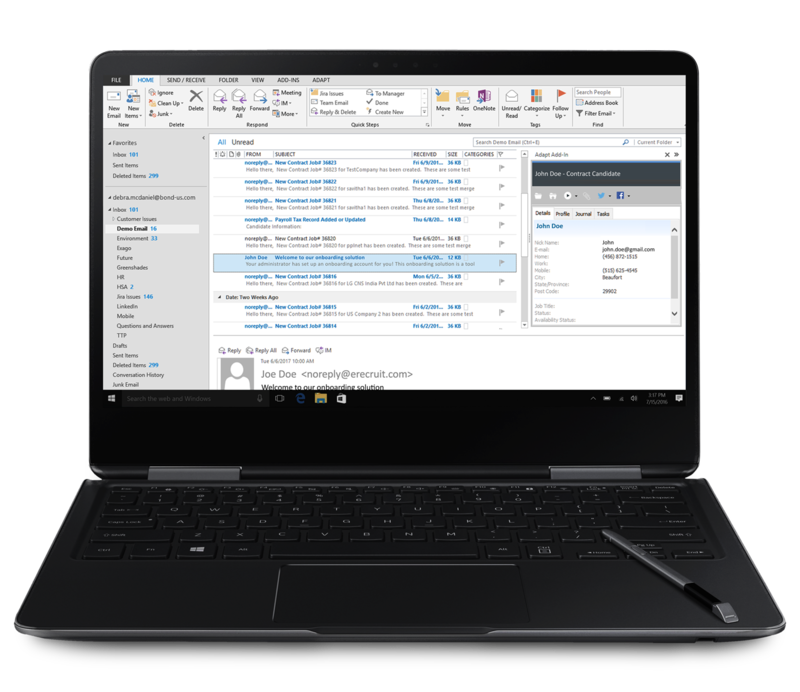 Easily organize and manage applicant information and communications with intuitive folders and a powerful search center. 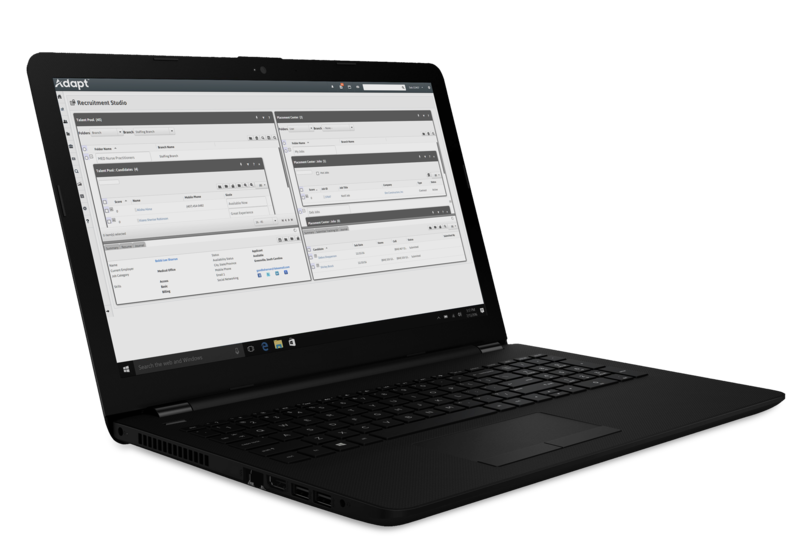 The ability to manage daily tasks on one screen improves productivity on revenue-generating activities to maximize profitability. Fast and easy applicant communication through functionality to send emails or text messages. When working at the speed of light, you don’t want to move back and forth from your inbox to your applicant tracking system. Adapt’s seamless Outlook integration allows recruiters to schedule interviews, forward resumes to the client, and handle all day-to-day operations without leaving Adapt recruiting software. Documenting conversations and inputting notes is done quickly. Positively impact customer relations with rapid responses to client queries by providing needed information with a fast way to find answers to their questions, all while compiling the message in Adapt. Comprehensive search capabilities locate candidates by resume, location, job history, college education and more. Speed up sourcing efforts using your current database with powerful search and match technology that automatically scores the candidates from entered keywords so you can easily review the most qualified applicants then drag and drop them into the chosen talent pool. Streamline the search-and-apply process with Adapt Compass Career Site. Easily incorporate job postings and applications on your company’s website using Adapt Compass Career Site, which allows candidates to search and apply for jobs by keyword and location from any smartphone or device. Job postings are designed to provide maximum online visibility through Search Engine Optimized (SEO) URLs. Adapt Compass Career Site streamlines the search-and-apply process to engage candidates in a unified location where electronic onboarding processes also take place. The user-friendly interface allows candidates to search for jobs by keyword and location on any digital device, or update their profiles in real-time. By utilizing SEO-friendly URLs for job postings that are incorporated into your company’s site, opportunities are given better exposure both on search engines and job-aggregator sites. Your agency has the ability to customize job applications and choose application methods to suit individual business needs. Keeping all information in a secure, central location simplifies workflows and speeds up time-to-fill ratios. For fast, integrated job postings to third-party job boards, Adapt Job Feed gives staffing agencies the ability to set-up job feeds to any job-aggregator sites that accept XML files. You can implement multiple new job posting feeds without customization or configuration to expand your job posting capability while reducing the administrative burden for recruiters or system administrators.